How is your Lunar New Year so far? Mine has been pretty uneventful since I’m not back in my hometown (Bintulu). My mom has already ‘escaped’ to Oz to spend a month with my sister so I thought I’d just stay put. No annoying questions about marriage and kids. Heh. We did spent reunion night joining our good friend Eklern’s family at Oriental Banquet. That was lovely. May the year of Water Dragon brings you prosperity, good luck, and abundance of happiness. Forecast for my Chinese Horoscope (Pig.. Oink Oink) looks really positive in terms of career and success so I’m looking forward to a good year! And now, back to food. I’ve been craving for Vietnamese food lately, many thanks to discovery of blogs like Ravenous Couple and Wandering Chopsticks. Melbourne is blessed with abundance of Vietnamese fare from the CBD all the way to the suburbs. So anytime you feel like a big bowl of Pho, or a plate of Broken Rice your wish will be fulfilled almost instantly. Best thing is you can fill your stomach for less than AUD10 per visit! I’ve yet to see any Vietnamese restaurants near me though in KL. Which means I’ll have to make them myself? Hmm. After browsing a few recipes and getting really hungry in the process. I’ve decided to start with the simplest dish, one that I’ve been craving for: The Lemongrass Pork Chop. This dish takes me way back to the first couple of years in Melbourne. I used to have it everytime I visit this Hong Kong style fast food joint in Chinatown called Dessert House. Vietnamese food in HK ‘dessert’ joint, you ask? Ironically, this is one of their ‘specials’ people kept coming back for (well I know it’s definitely not for the service) and it takes a special place in my food memory folder. The fragrant pork chops, simply flavoured by lemongrass and fish sauce, topped with the addictive fried scallion, and crispy fried egg with gooey centre… I can have it again! Being me, of course, I’ve added some more greens and tried to use as little oil as possible. So here it is, a comfort dish made with love sans the grease. Lemongrass Pork Chop with Rice. You could either chop the ingredients or just dump everything in food processor and blend. Marinate the pork chops with for at least a few hours, overnight would be best. To cook either grill it or just pan fry it on high heat, only taking less than 10 minutes. Meanwhile, fry about 1 cup of chopped scallion in oil briefly (this makes the dish!) before sprinkling tiny amount of salt on it. Cook the rice, blanch the choy sum, and fried the eggs. Then it’s a matter of putting the dish together, drizzling some extra fish sauce or soy sauce on top of the eggs. Devour when hot! You could also use Chicken thighs instead of Pork Chops. 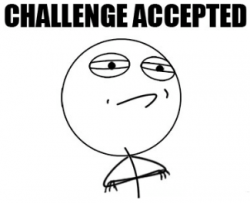 In fact, I’m doing that tonight! Looks delicious. Think I could help with that one etc. Er. Without the fish sauce. Thought that was too easy. Heh. 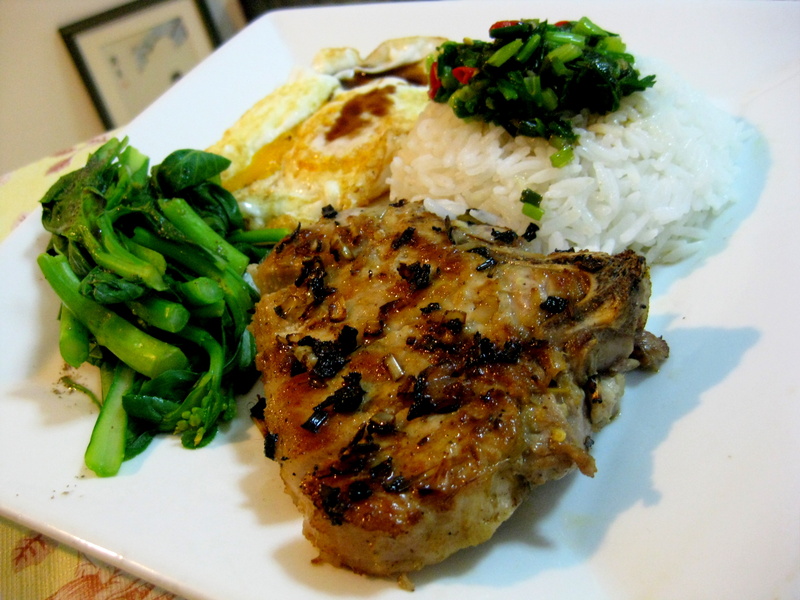 Very nice pork chop recipe, love the addition of lemon grass, one of my favorite seasonings. Found a good article about Vietnamese Fish Sauce http://vietworldkitchen.typepad.com/blog/2008/11/fish-sauce-buying-guide.html hope that helps! thanx for the link:D saves me from my blurness.